Today is Sarah’s birthday. Happy Birthday, Sarah! 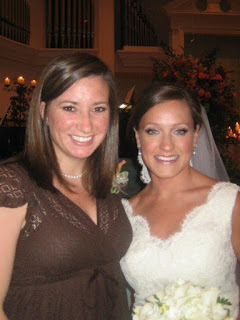 My first encounter with Sarah was in Montgomery in January of 2003. A little soldier came marching onto Alabama’s Junior Miss stage and dazzled the whole audience with her Boogie Woogie Bugle Boy backflips. It was love at first sight - I thought she was a doll, literally. So when I started hearing lots more about her later that August (cough rush cough), I was eager to get to know her. Sarah is the kind of person whose reputation precedes her in a very good way and recruitment was no exception. Right from the start, she was a huge asset to our sorority. She tried out for Freshman Forum and I was so pleased that she was one of the ones chosen to participate in that group during the year I was its director. I enjoyed getting to know Sarah in that capacity and watching her rise among her peers as a classy and hard-working young lady. A year later, I was fortunate enough to be nominated for Homecoming Queen. Every candidate has a campaign manager. Sarah was announced as mine before I really even got to ask her. I remember the look on her face when Anna said it. Kind of a “alright, why not?” face. But she took me on, along with all the other plates she had spinning that semester, and was gracious and patient every step of the way. Sarah and I got to know each other VERY well that fall - meetings at Speedy Printers, meetings with E-board, meetings with the rest of the campaign staff… if we weren’t in class, we were in a meeting. And it all worked out! She put in so much time and effort into the whole thing that I will be forever grateful. 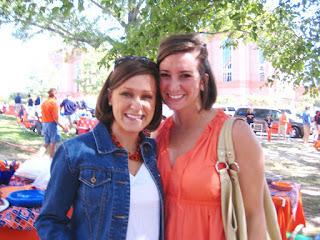 Sorry, Sarah; this is the only photo I can find of us from that week - the rest are in Alabama! I was surprised when Sarah and Clay started dating, but eventually saw that they were a good fit. Iron sharpens iron and they sure do sharpen each other. It was a neat union to watch come together and I was so honored to be included in their wedding festivities and a part of their special day. 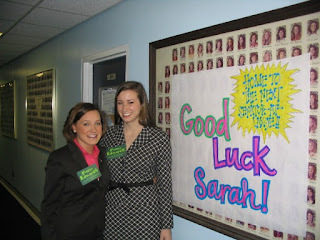 Sarah, you are one of the most clever, most admired, smartest, hardest working individuals I have ever met. You have been such a faithful friend, from the Homecoming campaign to all my questions about running and everything in between – I have relied on you so much throughout our friendship and you are always there without batting an eye. You are such a rock for so, so many people. Life just comes naturally for you. School, activities, wifely duties – every stage life brings you seems to fit you like a glove. I can’t wait for the next stage (cough motherhood cough) but I guess I will have to. Thanks for being such a good, kind, caring friend. I wish we saw each other more often but that's the way life goes. Fortunately for me, I know you'll always be there and I hope you expect the same from me! I love you dearly and hope your 25th year is your best year yet! Thank you sweet Lindsay!!!!! What a great birthday present! Love you! Great post! Happy birthday Sarah, and thanks Lindsay for putting into words all of the wonderful things about Sarah.